Good morning all, it's time for another fresh challenge here at DYSU! We had some fabulous Scallop creations last week, making it so hard for us to choose the Top Three! Thank you all for continuing to inspire and create with us here at DYSU. This week we have the theme of Use Warm Colours in your creations! So, with the onset of Autumn or Fall, we can take inspiration from the beautiful colours that nature is creating! For my card this week I used the Fall Pumpkins image from Broken Box Stock. 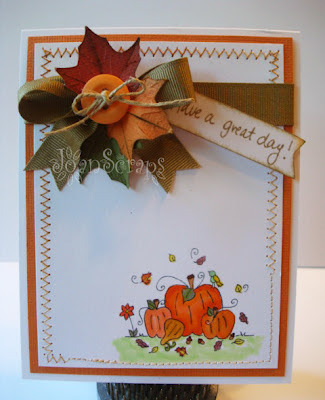 This week card was very simple to make. I just printed my image in a 3.75" X 5" piece of cardstock. next step was to color those great pumpkins. I cropped a matching color cardstock to 4" X 5.25" and adhere my colored panel to it. Then I added some stitching and a bow with some leaves. I love the colors of this card. Fall colors are so soothing and calm, don't you agree? If you do then I will love to see your creation using them, Just make a card and post it in DYSU. Have a great day and thanks for the visit!! Love this card Joan. 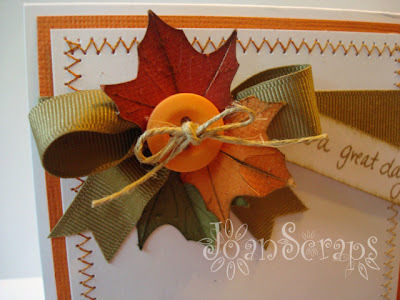 Great layout and that bow with the leaves is so pretty. omg this is gorgeous! 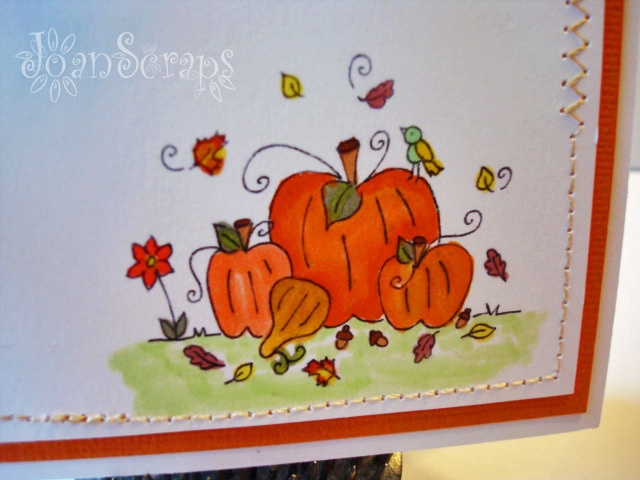 i LOVE the bow/leaves detail and it's genius design the way you've changed the stitching around the pumpkins image...genius!